Introduction: The calcaneus is the most frequently injured tarsal bone. Many calcaneal fractures are work-related, as they result from a fall from height, especially in males age 35-45 years. These fractures frequently result in long-term disability with potentially severe economic impact on the patient. Operative treatment of displaced calcaneal fractures has been a controversial due to tissue condition and wound infection. In this study our objective is to investigate the outcome of percutaneous fixation of displaced calcaneal fractures with cannulated cancellous screws. Materials & methods: A retrospective review of 14 patients with 16 calcaneal fractures who had percutaneous reduction and screw fixation for displaced fracture of calcaneus was done. The patients were assessed with plain radiography. In developing countries like India cost of medical treatment is often a concern so CT scan was not done as most of the patients were poor and did not afford the treatment. The fractures were classified according Essex Lopresti classification system. Functional assessment involved use of Calcaneal Fracture Scoring System of Kerr et al16 and the Maryland foot scoring. Results: The age of the patients ranged from 23 to 62 years (mean: 34 yrs).Time to union averaged 13 weeks (range 11 to16). The treatment outcome as measured by Calcaneal Fracture Scoring System ranged from 63 to 94 (mean 79). The mean Calcaneal Fracture score was 87 (72-91/100) for the tongue shaped group and 73 (52- 83/100) for the joint depression group (p=0.0034). The mean Maryland Foot Score was 73/100, with 86% of patients achieving fair to excellent results. The mean functional score was 83 (42-91/100) for the tongue shaped group and 61 (52- 73/100) for the joint depression group (p=0.002). Conclusion: Percutaneus fixation of fracture calcaneum, offer the prospect of fewer complications and better outcome especially in Essex-Lopresti tongue type fracture. Keywords: Displaced intra-articular calcaneal fractures, percutaneous fixation. Following this line of reasoning, percutaneous reduction and fixation could be the ideal option for displaced fracture of calcaneus addressing both the above issues. Thus we present a study to evaluate the results of percutaneous reduction and fixation of displaced fracture calcaneus. 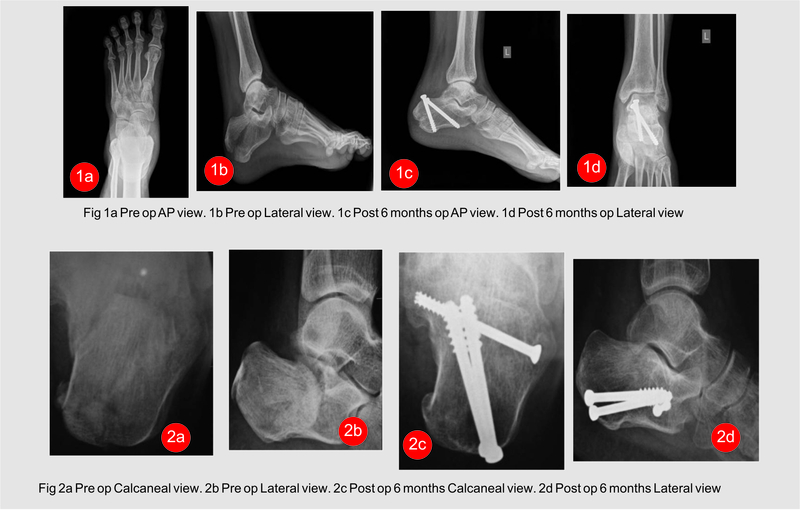 A retrospective review of 14 patients with 16 calcaneal fractures who had percutaneous reduction and screw fixation between June 2011 and May 2013 was done. The patients were assessed with plain radiography. In developing countries like India cost of medical treatment is often a concern so CT scan was not done as most of the patients were poor and did not afford the treatment. Standard views for calcaneus were performed along with antero-posterior view of the foot and the ankle to exclude associated fractures. Only displaced fracture of the calcaneus was included in the study. After preoperative assessment, patients underwent operative procedures within 7 days; in case of excessive swelling, surgery was delayed for 10-14 days in order to allow soft tissue swelling to resolve. In such cases, the foot was placed in a posterior plaster splint and the limb was elevated. Surgery was undertaken after the edema had settled completely and the wrinkle sign appeared. Postoperatively, a below-knee plaster cast is applied with the foot at a right angle. All patients were kept non-weight-bearing for six weeks. Ankle mobilization was started after the plaster slab was discarded in 6 weeks. The patients were followed up at 6 weeks, 3 months, 6 months and 12 months time in the OPD. Partial weight bearing was allowed in six weeks time and full weight bearing on the affected limb was allowed after 3 months post-op. Functional assessment involved use of Calcaneal Fracture Scoring System of Kerr et al16 and Maryland foot scoring system by asking patients about discomfort/pain during activity and rest, ability to stand and walk, ability to return to work, duration of absence fr om work and any change in the size of the shoe. An overall rating of excellent (90-100), good (80-89), fair (65-79) and poor (below 64) was assigned to each fracture. Patients were also enquired about their satisfaction with their treatment outcome. The age of the patients ranged from 23 to 62 years (mean: 34 yrs). 11 patients were males and 3 were females. The right foot was affected in 7 patients, the left in 5 and bilateral feet in 2 patients. All the patients had sustained this injury as result of fall from height. Four patients had associated lumbar spine fracture which was treated conservatively. All fractures were subdivided according to Essex Lopresti classification system based on x ray findings. Ten fractures were tongue type and remaining six were joint depression type. Average time delay from injury to surgery was 7 days (range, 4- 14 days). Mean follow up was 15 months (range 6 – 18 months). All fractures healed without any major complication. Two patients developed superficial wound infection which healed with dressings and antibiotics. Time to union, judged both clinically and radiologically, averaged 13 weeks (range 11 to16). The treatment outcome as measured by Calcaneal Fracture Scoring System ranged from 63 to 94 (mean 79). The mean Calcaneal Fracture score was 87 (72-91/100) for the tongue type fracture group and 73 (52- 83/100) for the joint depression group (p=0.0034). The mean Maryland Foot Score was 73/100, with 86% of patients achieving fair to excellent results. The mean functional score was 83 (42-91/100) for the tongue type fracture group and 61 (52- 73/100) for the joint depression group (p = 0.002). (Table 1) The overall functional outcome in was significantly better in the tongue shaped group in comparison to the joint depression group. 12 of 14 patients (86%) were satisfied with the treatment. None of the patients required sub-talar fusion till the last follow-up. Calcaneus fractures comprise 2% of all fractures, and 60-75% of these fractures are intraarticular. Ten percent of the patients with calcaneus fractures have accompanying spine fractures and other extremity injuries. Ninety percent of the calcaneus fractures occur in males employed in industry aged between 21 and 45 years, which demonstrate that these fractures have important economic impacts.17 Calcaneus fractures are generally due to high-energy traumas such as a fall from height and traffic accidents. In our study 87% patients were between 21 to 45 years of age and in all the cases the cause of fracture was fall from height. Four patients had associated fracture of spine which accounts for around 28% which is quite high when compared to other studies but this can be explained by the cause of fracture being fall from height in all the 14 patients. As fall from height is also the commonest cause of wedge compression fracture of spine. Essex-Lopresti classified displaced intra-articular calcaneal fractures as either tongue type or joint depression type, based on the configuration of a secondary fracture line through the posterior facet as seen on plain radiograph. He suggested that non-displaced fractures be treated non-surgically. Displaced-tongue fractures are best treated by percutaneous pin fixation, using a large posterior reduction tool for closed reduction. Joint-depression fractures require surgical reduction because of fracture impaction.18 Essex-lopresti classification is the most commonly used x ray based classification system for calcaneal fractures and we have assessed the fractures only on x rays due to economic constrains so we have used the same in our study. Also we compared the outcome of both tongue type and articular depression type fracture managed with percutaneous reduction and fixation. Options for treating displaced calcaneal fractures are conservative or operative. Kitoaka et al.19] reviewed the results of the walking analyses of 16 of 27 patients, who were not subjected to reduction and were treated with plaster. Many patients in their study showed differences in walking especially on uneven grounds, which showed that conservative treatment of displaced calcaneus fractures results in permanent functional disorders, at least to some extent. O’Farrel et al.20 treated 12 patients with surgical methods and 12 patients with conservative methods. They concluded that the surgical treatment was superior. Similarly, Leung et al21 compared 44 patients treated by surgical methods with 19 patients treated conservatively according to the results of three-year follow-up on average. Comparing pain, ease of movement, return to job, and swallowed back of the foot, they found that the results of the group treated surgically were significantly better. Thus from the above studies it is clear that surgical treatment is the only viable alternative for displaced fractures of calcaneum. For patients who are to undergo surgical treatment, timing of the surgery is one of the most important determinants for the outcome of treatment and determined by subsidence of edema and appearance of wrinkle sign, persistence of which may lead to soft tissue healing problems and high infection rate, while surgery after 3 weeks of injury causes difficulty in reduction, due to early consolidation of fracture. Hence it is better to delay surgery till soft tissue heals and during this presurgical period patients should be managed by splinting with proper padding, limb elevation and soft tissue care. Thus most authors suggest that the surgical intervention should take place after the edema in the foot has regressed and the soft tissue envelope is conducive. Surgical results are dependent upon the timing of surgery; according to Sanders, the correct timing is between 7 and 10 days from trauma, because if treated earlier there is risk of compartmental syndrome or soft tissue damage, and if treated later the results could be otherwise unsatisfactory.22.23,24 Average time delay from injury to surgery was 7 days in our study which is probably the optimum time for surgical intervention. We applied below knee plaster splint with elevation of limb till the swelling nad edema subsided. The balance between the percentage of anatomical reduction and the amount of soft tissue damage should be carefully weighted in the management of fracture calcaneus especially the severely comminuted type. The choice lies between trail of full reduction with extensive soft tissue damage or reasonable reduction with minimal soft tissue insult. Weber et al25 treated fifty displaced intra-articular calcaneal fractures using different methods of fixation, which resulted into higher incidence of deep infection and devascularization of the lateral wall of the calcaneus in extensile approach. Damian Griffin et al26 in their multicentre, two arm, parallel group, assessor blinded randomised controlled trial including 151 calcaneal fractures concluded that complications and reoperations were much more after open reduction and internal fixation of typical, closed, displaced intra-articular fractures of the calcaneus. Thus to find the solution for this problem and to find the way between two extremes like conservative management and open reduction and internal fixation for displaced calcaneal fractures which have their inherent drawbacks, our study focuses on percutaneus reduction and fixation of these notorious fractures. The treatment outcome in our study as measured by Calcaneal Fracture Scoring System ranged from 63 to 94 (mean 79) and the mean Maryland Foot Score was 73/100, with 86% of patients achieving fair to excellent results with only two patients having minor complication like superficial skin infection. Similar results were also seen by authors like Essex-Lopresti18 and Tim Schepers et al.27 who concluded that percutaneous reduction by skeletal distraction and screw fixation can be considered a useful treatment modality, especially in severely comminuted fractures, expected wound complications in open fractures and patients with diabetes or peripheral vascular occlusive disease. Even though the percutaneous reduction and fixation gives good results in displaced intra-articular calcaneal fractures, the results were not same in both tongue type and articular depression type fractures. Results were significantly better in tongue type fractures than articular depression type when both Calcaneal Fracture Scoring System and Maryland Foot Score were considered. The mean Calcaneal Fracture score was 87 (72-91/100) for the tongue shaped group and 73 (52- 83/100) for the joint depression group (p=0.0034). The mean functional score was 83 (42-91/100) for the tongue shaped group and 61 (52- 73/100) for the joint depression group (p = 0.002). These results are in concordance with the classical work by Essex-Lopresti18 who suggested that tongue type fractures should be managed by percutaneous techniques and joint depression type fracture require open reduction. Thus we conclude that percutaneous reduction and fixation with cancellous screws is a suitable mode of treatment for displaced intra-articular calcaneal fractures. But the results depend upon the type of fracture, tongue type fractures having significantly better results than articular depression type. 2. Nicklebur S, Dixon TB, Probe R. Calcaneus fractures. EMedicine, July 21, 2004. http://www.emedicine.com/ orthoped/topic33.htm. 5. Cotton FJ, Henderson FF. Results of fractures of the os calcis. Am J Orthop Surg 1916; 14: 290 –298. 6. Jiří Stehlík, Jan Štulík et al. Calcaneal fractures, 1st edition; Galén, 2010; p-9. 7. Abidi NA, Dhawan S, Gruen GS et al. Wound healing risk factors after open reduction and internal fixation of calcaneal fractures. Foot Ankle Int 1998 ; 19 : 856-861. 8. Bridgeman SA, Dunn KM, McBride DJ, Richards PJ. Interventions for treating calcaneal fractures. Cochrane Database Syst Rev 2002 ; 2 : CD001161. 9. Buckley RE, Meek RN. Comparison of open vs. closed reduction of intraarticular calcaneal fractures : a matched cohort in workmen. J Orthop Trauma 1992 ; 6 : 216-222. 10. Buckley R, Tough S, McCormack R et al. Operative compared with non operative treatment of displaced intraarticular calcaneal fractures. A prospective, randomised, controlled multicenter trial. J Bone Joint Surg 2002 ; 84- A : 1733-1744. 11. Buckley R, Tough S. Displaced intra-articular calcaneal fractures. J Am Acad Othop Surg 2004 ; 12 : 172-178. 12. Al-Mudhaffar M, Prasad CVR, Mofidi A. Wound complications following operative fixation of calcaneal fractures. Injury.2000;31(6):461–4. 13. Zwipp H, Tscherne H, Thermann H, et al. Osteosynthesis of Displaced Intra-Articular Fractures of the Calcaneus: Results in 123 Cases. Clin Orthop Relat Res 1993; (290): 76-86. 14. Randle JA, Kreder HJ, Stephen D, et al. Should Calcaneal Fractures be Treated Surgically? A Meta-Analysis. Clin Orthop Relat Res 2000; (377): 217-27. 15. Essex-Lopresti P. The mechanism, reduction technique, and results in fractures of the os calcis. Br J Surg 1952; 39:395–419. 16. Kerr PS, Prothero DL, Atkins RM. Assessing outcome following calcaneal fracture: a rational scoring system. Injury. 1996; 27(1): 35-8. 17. de Souza LJ, Rutledge E. Grouping of intraarticular calcaneal fractures relative to treatment options. Clin Orthop Relat Res 2004; 420:261-7. 18. Essex-Lopresti P: The mechanism, reduction technique, and results in fractures of the os calcis. Br J Surg 1952;39: 395-419. 19. Kitaoka HB, Schaap EJ, Chao EY, An KN. Displaced intraarticular fractures of the calcaneus treated non operatively. Clinical results and analysis of motion and ground-reaction and temporal forces. J Bone Joint Surg [Am] 1994;76:1531- 40. 20. O’Farrell DA, O’Byrne JM, McCabe JP, Stephens MM. Fractures of the os calcis: improved results with internal fixation. Injury 1993;24:263-5. 21. Leung KS, Yuen KM, Chan WS. Operative treatment of dis-placed intra-articular fractures of the calcaneum. Medium term results. J Bone Joint Surg Br 1993;75:196-201. 22. Zwipp H, Rammelt S, Gavlik JM. Calcaneus fractures. In: Surgical techniques in orthopaedics and traumatology. Paris: Elsevier SAS; 2000. p. 55-650-B, 7. 23. Sanders R, Gregory P. Operative treatment of intra-articular fractures of the calcaneus. Orthop Clin North Am 1995;26:203-14. 25. Weber M, Lehmann O, Sägesser D, et al. Limited Open Reduction and Internal Fixation of Displaced Intra-Articular Fractures of the Calcaneum. J Bone Joint Surg Br 2008; 90(12): 1608-16. 27. Tim Schepers, Lucas M.M. Vogels, Inger B. Schipper, Peter Patka. Percutaneous Reduction and Fixation of Intraarticular Calcaneal Fractures. Oper Orthop Traumatol 2008;20:168–75. How to Cite this article: Kawalkar AC & Badole CM. Percutaneous Fixation of Displaced Intra-Articular Calcaneal Fractures . Journal of Trauma and Orthopaedic Surgery.Jan – March 2017;12(1)23-27.